Atlas is defining the standard in naval mine countermeasure systems for decades and is the only overall MCM system supplier providing the complete sensor to effector capability. The actual MCM Vessels operated by Belgium and the Netherlands were integrated by Atlas Elektronic and are equipped with the combat proven Atlas MCM Command and Control System (Integrated Mine Countermeasures System – IMCMS). 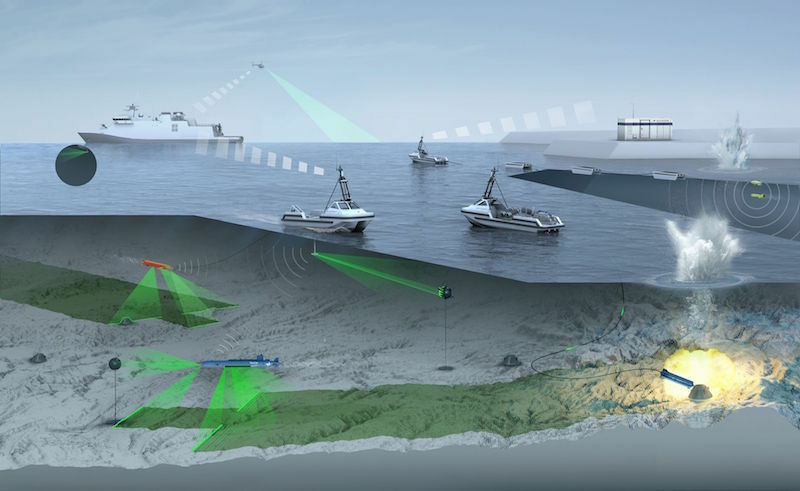 Atlas is offering its next generation MCM toolbox, containing IMCMS, ARCIMS USV, SeaCat AUV, Towed SAS, influenced mine sweeping equipment capability, a vertical take-off and landing drone, mine avoidance sonar as well as the related system integration. The proposed Center for Maritime Autonomy (CMA) lays out the vision of Atlas Elektronik on how the Belgian Navy could succeed in the upcoming new area of naval force development. The Belgian Navy is the ideal partner to launch the CMA because it is agile and open towards new concepts such as the offered MCM toolbox. In adopting a holistic approach to naval innovation, the CMA will foster the Belgian Navy role as a thought and practice leader on maritime autonomy in the 21st century. CMA activities will support the MCM community as early adopters of unmanned technology and will expand to other warfare areas such as ASW, harbor and critical infrastructure protection an. Furthermore, opening up the CMA for cooperation with partners from other European nations (and beyond) strengthens Belgium’s strong European vocation and will be instrumental in shaping European thinking on future naval operations with unmanned systems. The CMA is conceptualized as a public private partnership (PPP) between Belgium, Belgian industry, Belgian academia and research institutions and Atlas Elektronic. Consequently, the CMA will be a Belgian institution in Belgium for Belgium. Therefore, the CMA will utilize a comprehensive partnership program to make maximum use of the technology expertise of Belgium’s research and industrial ecosystem. In doing so, the CMA will be a major hub within this ecosystem for applied research and development focusing on the naval and maritime application of unmanned systems. In addition, the Center will also become a major gateway for Belgium’s partners to connect with international stakeholders and vice versa. -- In the international defense arena, the CMA could join forces with different Centers of Excellence that have been established e.g. within NATO, the NATO Center for Maritime Research & Experimentation (CMRE) or the European Defense Agency. -- The Belgian defense industry offers opportunities for cooperation through two key clusters – the Skywin aerospace cluster of Wallonia and the Flemish Space Industry. -- Besides the defense industry, Belgium’s regions offer a vibrant cluster community. For example, the CMA could tap into the Blue Cluster of Flanders (marine industry), the Belgian Offshore Platform in Brussels, or the InfoPole Cluster of Wallonia (information and communication technology, ICT). -- Belgium’s startup community is equally vibrant offering opportunities for cooperation in technology fields like robotics and unmanned systems, artificial intelligence, augmented/virtual reality, cybersecurity, as well as data analytics. -- In all of these technology fields Belgium’s regions also offer most interesting research institutes, such as the two high-performance computing institutions Canaero (Wallonia) and the Vlaams Supercomputer Centrum, the IdLab at the Ghent University with a focus on distributed intelligence and machine learning as well as several research institutes working on additive manufacturing, materials technology and energy management. The CMA will support the Belgian Navy’s position as lead nation in autonomous naval MCM. The CMA also encompasses Atlas’ ambition to be part of the next generation of naval warfare systems for the decades to come. As neighbors within the European Union Atlas will be a reliable partner even in times of changing global security environments. Due to Atlas’ experience as MCM capability provider and our broad customer base, our mission is to develop the next generation of MCM systems. If the effects on other business in the field of autonomous systems besides MCM (e.g. Anti-Submarine Warfare (ASW), security of critical infrastructure, offshore industry) and secondary effects based on the knowledge built up around the center for maritime autonomy are taken into account a much higher and sustainable impact on the Belgian industry will occur. Click here for a paper (15 PDF pages) on the Atlas MCM concept.